"You do question yourself sometimes and my time at Motherwell has helped me to stay positive and carry on believing in myself." For much of the last year, Louis Moult has found himself a long way from the life he knew in Scotland. So long one of the Premiership's most prolific strikers with 50 goals in two and a half seasons, now at Preston Moult has learned to dig deep into his resolves of self belief, character and sheer determination to prove himself at Deepdale. Struggling for starts and regular game time with the Championship club, the former Motherwell cult hero netted his third goal in six games on Saturday, fuelling the fire of confidence which is beginning to burn brightly again within the 26-year-old. Here, Moult talks to BBC Scotland about his low moments over the past year, how his family have kept him going, and his apology to his far-travelled followers. This time last year, Moult was preparing for his first cup final. Already entrenched as Motherwell's inspirational striker, it was his double against Rangers in the semis at Hampden that paved the way for the first of two showpiece finales for the Lanarkshire club last season. That afternoon was one of several memories that still stay with the former Wrexham forward from his time at Fir Park. Along with scoring four goals in a derby against Hamilton Academical, or netting a brace at Parkhead to sink champions Celtic, these thoughts have swirled about in the mind of the ferociously ambitious Moult during the difficult moments of his first year at Preston. After moving in the January transfer window, the man who averaged a goal in less than every two games in Scotland had to wait eight matches before his first of two goals in his maiden season arrived in March. 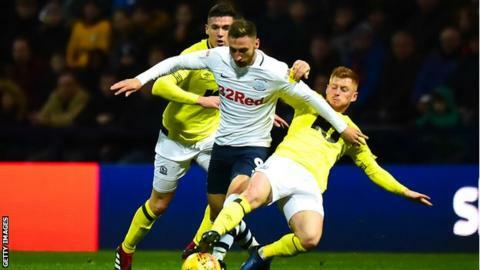 "I still look back in my time in Scotland quite often, actually," said Moult, whose goal in Saturday's 4-1 win over Blackburn Rovers helped move Preston into 16th place in the Championship. "I think because I'm not playing as much it gives me a little boost, because when you're not playing it can dent your confidence. You do question yourself sometimes and my time at Motherwell has helped me to stay positive and carry on believing in myself. "It's a bit of everything. The kind of player I was up there, the kind of goals I scored up there, but more than anything it's just my general play. "It's more or less my missus who says that to me. You do get that little bit of self belief that goes, and she's the one that says, 'look what you did at Motherwell' and 'you can do it'. She's helped me all the way, really." For all those frustrations, Moult insists the move to Preston has been a positive experience and one he remains sure he can fulfil. The striker, who started his career at Stoke City, has played his part in an eight-game unbeaten run for Alex Neil's team. "I've enjoyed being back down south and being closer to the family, but me as a person, if anyone knows me, they'll know I just love to play football," he said. "So that part has been very, very frustrating but I'm loving my time at Preston. "I can get a bit miserable when I don't play, I'm just that kind of character. It's been a little bit frustrating that I've not really managed to string games together for one reason or another but I've got to try and stay positive and keep at it. "It's something I need to deal with better. I need to keep a smile on my face regardless. I've worked quite hard on that this season to try and be good around the place regardless of if I'm playing or not. Having the kids and missus at home has helped take my mind off things. "I'm very, very fortunate to be in the job I'm in and at the club I'm at, and I try every day. I'll keep trying every day to prove that I can play in this division." As well as looking back fondly at his time in Scotland, Moult occasionally gets little visual reminders of the club he still holds close to his heart. During last season and this current campaign, Motherwell fans have travelled south to watch the man they idolised in claret and amber, even if they sometimes didn't get to see their man in action. "It's unbelievable, it doesn't happen very often in football," he added. "It's happened quite a lot actually and the support I have received from them, it's ridiculous. I've said how much they mean to me and they've helped me become the man I am today. Most of the time it's been a wasted journey for them, though, so I feel sorry for them. "My time at Motherwell was amazing. When I joined I was going into it quite unaware what Scotland was about. I was very hungry and determined. "In the back of my head I wanted to do well but I didn't think it could have gone that well. I was very, very lucky."